Leapin' Lizards! They're Gonna Kill Annie! That quote, bye the way, comes from Chicago Tribune columnist Phil Rosenthal, a colleague of Annie's. 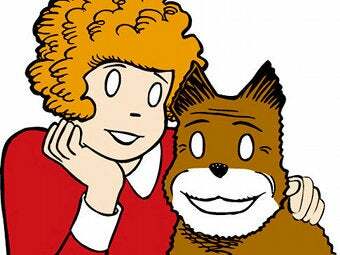 Little Orphan Annie has been a staple of the funnies since artist Harold Gray first created the strip (originally Little Orphan Otto) for the Trib in 1924. Although (largely thanks to the musical) the strip is associated with the Depression, in fact the spunky heroine predated the stock market crash by 5 years. And as anyone who's spent any time with the early comic knows, it was weird. There's Annie's strange rivalry with the short-lived Mrs. Warbucks, Daddy Warbucks' criticism of the New Deal (in fact, he was killed off during the 30s, only coming back to life after FDR's death), or the character of Mister Am, who may or may not be God. Now, Tribune Media Services, a division of Chicago Tribune parent Tribune Co., is pulling the plug. Although the strip's last episode is slated for 6/13, its current authors, Jay Maeder and artist Ted Slampyak, have optimistically - or sadistically? - ended it on a cliffhanger. And the company's president had this to say to the Trib; you decide whether it's heartening or depressing: "This doesn't mean that Annie won't come back … whether it's (in) comic books, graphic novels, in print, electronic. It's just too rich a vein (not) to mine." While this is undoubtedly melancholy, let's be honest: most of us haven't exactly been propping up Annie's livelihood, or can rattle off her latest adventures. We all have her blood on our hands. And her vacant eyes will haunt our dreams.